Sign up for Broadjam today to follow mOOnies, and be notified when they upload new stuff or update their news! 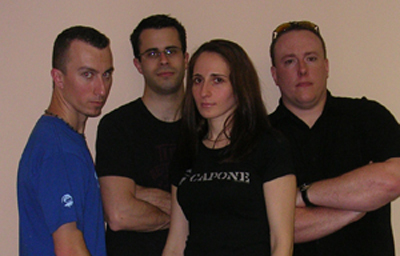 MOONIES is an original pop rock band based in New Jersey. The project began 1997 when Johny Moon's old band broke up. He decided to start his own group. He teamed up with Gianna Rivezzi on vocals, and Marc Durstewitz on drums. The band put out a 7 song CD called "In the Boonies" in 2000. The songs were recorded by Dave Lehner, who ended up filling bass. The band supported that album with showcases, opening for Gary U.S. Bonds at the Stone Pony and being the house band at Birch Hill. Since Marc moved out of state, John and Gianna took some time off to write and record new material. The Moon/Rivezzi songwriting team was back, this time with producer/vocal coach Jim Brown. They also reunited with former bandmates Jerry Bodtmann and George Prekel. In summer of 2005, the 12 song album "Fadin" was released and showed how the Moonies developed their musical and songwriting talents. Consquently, the band will be opening for some National Acts shortly.